Happy Friday! How ready are you for the weekend as I am!? This week went by really fast. It was filled with several shoots, driving across town going to different grocery stores, and then chilling in the evenings by catching up on This is Us. On Monday I made a huge batch of baked meatballs and it lasted us 3 full meals, but I made a different meal with them each time! It was glorious. Is this what meal prepping feels like? I need to try that. It made my life so much easier! Alright, so if you are wondering what to have for breakfast tomorrow morning, I have an answer for you: BAKED DONUTS. When we lived in NYC, there were a lot of hard decisions. And by hard decisions, I mean deciding on whether or not to have bagels or donuts for breakfast on Saturday morning. 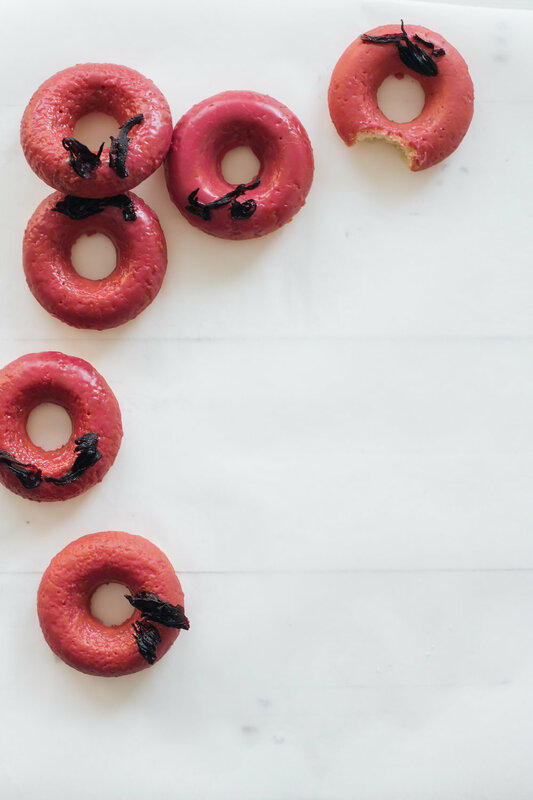 Most of the time we chose bagels, but if donuts won out there was still another decision to be made: which donut place do we go to!? One of our favorites was Dough Doughnuts. If you are visiting NYC I highly recommend!! 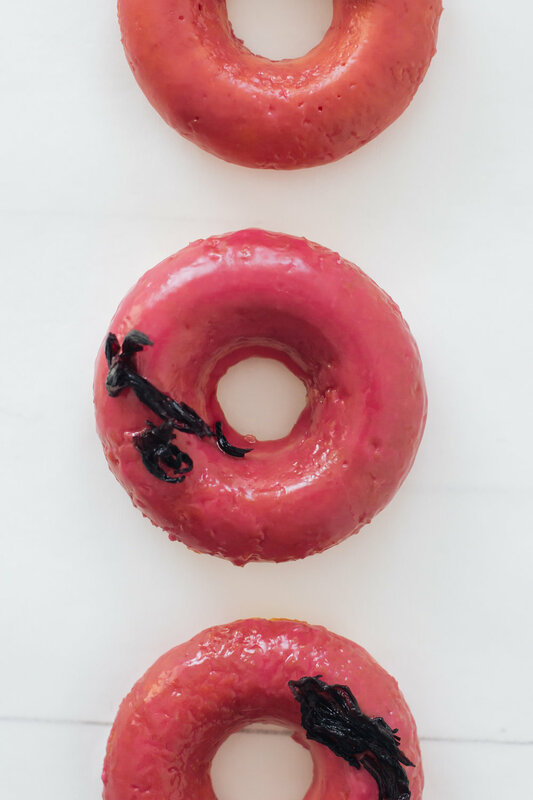 My favorite, as you can probably already guess, was their hibiscus doughnut. And if you are thinking what I'm thinking, yes, these would be perfect for Valentine's Day! 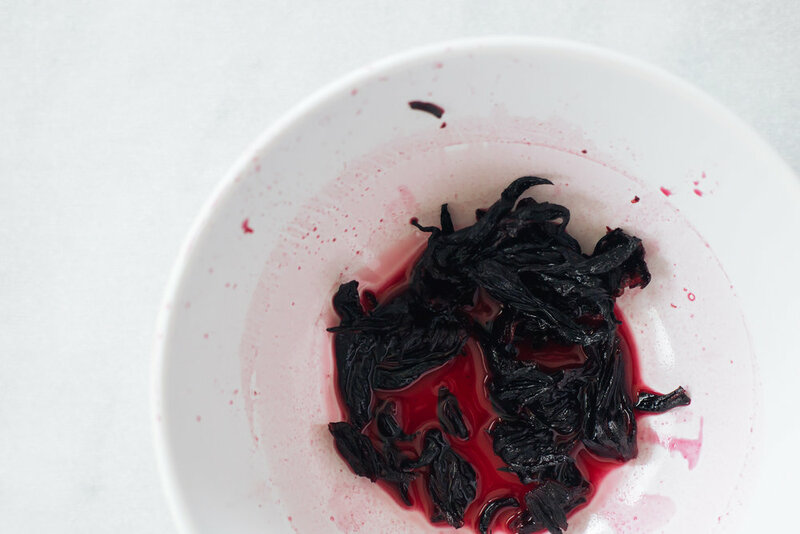 In a small saucepan, heat the water and hibiscus until simmering. Simmer for 10 minutes, and then pour everything into a bowl (including flowers). Let steep in refrigerator for one hour or until cool. Strain hibiscus water but keep the flowers for garnish! In a large bowl, whisk together flour, sugar, baking powder and salt. In a small bowl whisk together milk, egg, vanilla and melted butter. Pour the wet ingredients into the dry ingredients and mix until just combined. Lightly grease a 6 cavity donut pan (if you have two of these then grease them both). Spoon scant 1/4 cup of batter into each donut cavity. Batter should fill about 3/4 of each donut. Bake in preheated oven for 15-18 minutes, or until a toothpick inserted in the center comes out clean. Let cool in pan for a few minutes, before dumping out onto a cooling rack. 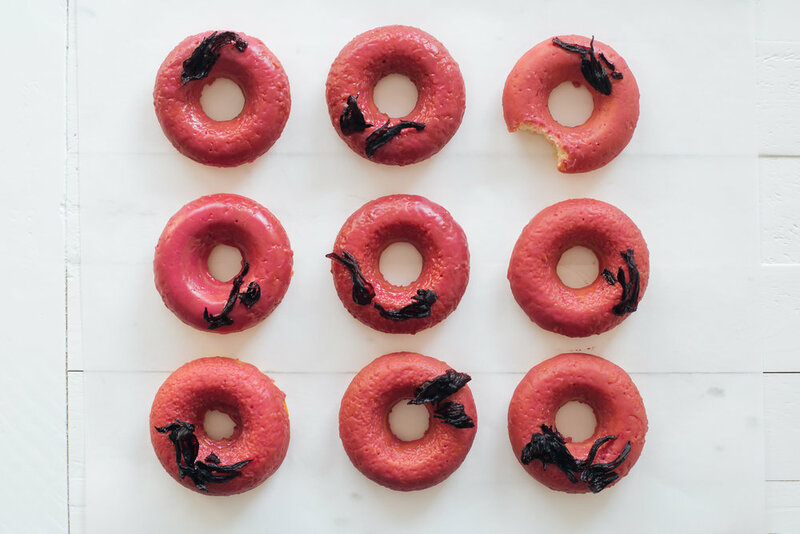 Repeat with remaining batter until all donuts are baked and cooled. 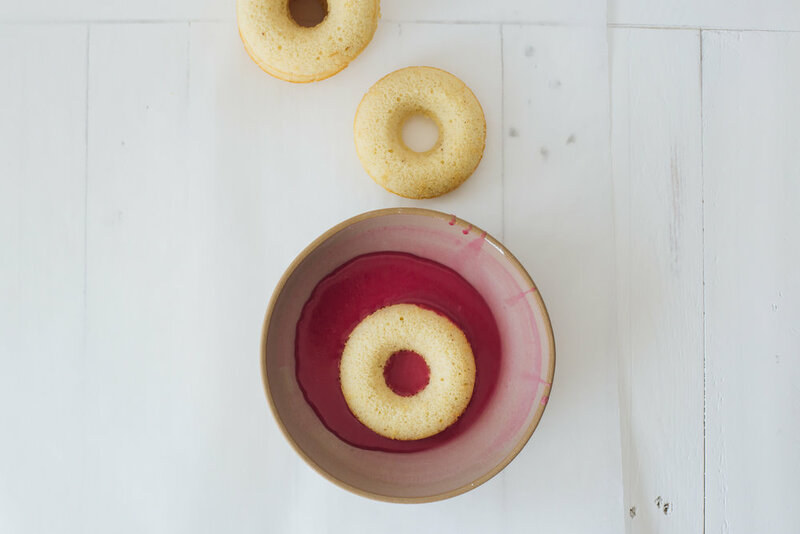 To make the glaze, whisk together powdered sugar, hibiscus liquid, and salt. Add more hibiscus syrup/powdered sugar to get desired consistency. 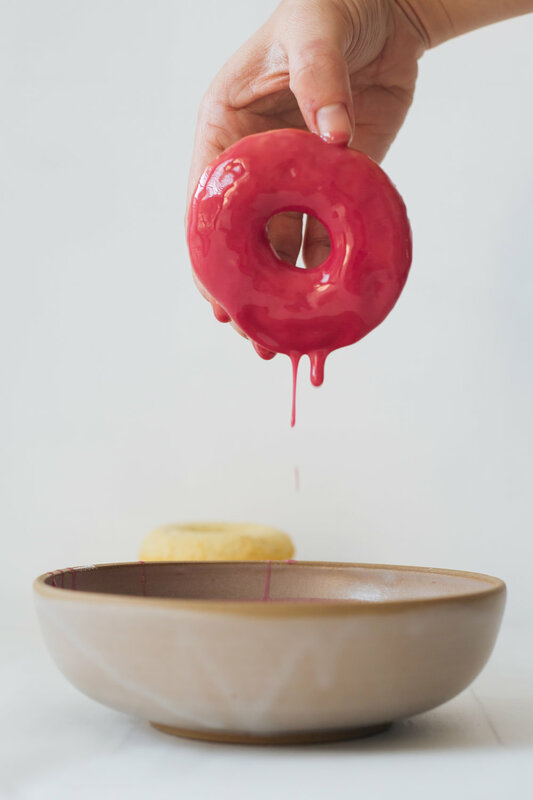 Dip cooled donuts into glaze. Let glaze harden slightly, about 10 minutes. Eat!! !